China's leaders are concerned about their newly acquired Tibetan city of Nagqu. It seems that the Chinese troops stationed there, and the Han Chinese settlers who will take over from the Tibetans who have lived there for millennia, are disturbed by the lack of trees. Nagqu is 4,500 meters above sea level, you see. 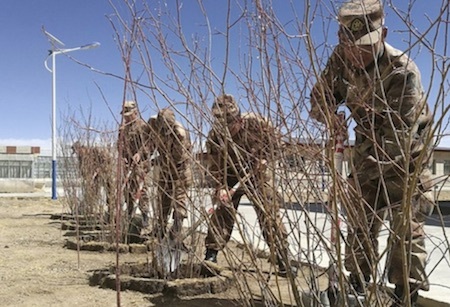 The absence of trees ranked along with the area’s lack of oxygen, extreme cold and geographic isolation as top reasons for the mental breakdown of Chinese military personnel in this city 4,500 metres above sea level. Soldiers from Nagqu who would go to Lhasa on leave were known to leap off their buses to hug a tree, in tears, according to the People’s Liberation Army Daily. Now China is taking the unprecedented – and expensive – step of harnessing solar power to melt permafrost to allow trees to grow in Nagqu. The project’s aim is to make the landscape more welcoming for Han settlers and soldiers struggling to cope emotionally with the treeless setting. Workers have set up grassland solar panels in the area to convert sunlight to electricity for an enormous copper-wire grid buried in the ground. The generated heat melts the subsurface layer of frozen soil to save tree roots from “frostbite”, according to scientists who have visited the experimental site. "Big Momma, it's cold here. We're going to freeze, all of us. We need heat. Can you give us a microwave spotlight? Have SUNSAT lock one of its projectors onto our transponder frequency and track us across the ice."